I Enjoy Being a Girl!! I love being a girl! I can wear a pink nighty and paint my nails pink. I can wear pink lipstick and pink blush too. I can put on my pink ballet slippers and a pink tutu!! And I can also visit Beverly at How Sweet the Sound and wish her and all of the other participants a Very Happy Pink Saturday Second Birthday!!! "Grab your coat and grab your hat, leave your worries on the doorstep. Just direct your feet to the sunny side of the street!" So goes an old tune. At our cottage we like to be prepared for any adventure and we always like to be happy. If you need a vintage straw hat from I Magnin, we have it. If you need a straw hat to protect you from the sun while on the links, we have it too. How about a vintage velvet riding helmet?? Check!! Need a vintage camera in it's case, we have you covered. Now how about a little straw bag to carry some cash to go thrifting for vintage treasures??? To see more vintage treasures hop on over to Suzanne's place for Vintage Thingie Thursday! You can find her at her fabulous blog The Colorado Lady. Wait a minute, I think I must have a vintage map to get you from Idaho to Colorado via the easiest route. 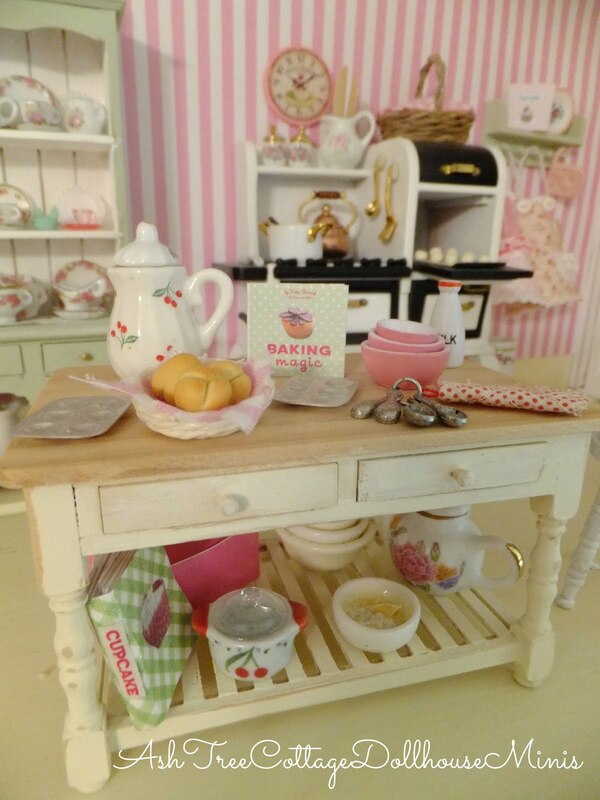 Shall I pack you a lunch in a vintage picnic basket?? What's that Bentley? I know I mentioned lunch, but you just had dinner!! Those of you who have visited my blog on Rednesday know that I really like red. There is a lot of red in my cottage. This is especially true in my kitchen where the reds have "gone wild"!! There are red storage containers in all shapes and sizes. There are red batter and mixing bowls and red spatulas too. There is a garlic peeler in red of course!! Vintage cookbooks for a bit of nostalgia. Just look at their charming red covers! Vintage style tea towels with cheerful touches of red too. Or if you prefer, a red rooster paper towel holder. Reds have gone wild in my kitchen!! How about a snack? I could fix you some cheddar cheese and apple on a cracker to give you some energy before you go visit Sue over at It's A Very Cherry World for her weekly Rednesday party. Yes, I know Bentley, you want a snack too. Be polite to our guests Bentley, and let them go first!! I am at my desk, day dreaming of a time when life was not so hectic. When important letters or themes for school were pecked out on the old Smith Corona typewriter. When ribbons had to be changed and there was no spell check. Ticonderoga #2 pencils filled a pencil holder. There were old rotary phones and people actually sat down and wrote letters. And when it was quiet you could hear the soft tick tock of the old Westclox Baby Ben. What are you day dreaming about this Table Top Tuesday? I know that Marty over at A Stroll Thru Life is day dreaming about the beach. Be sure to stop by and see what she won!! Until next time may all of your dreams be happy ones! I'm always on the look out for vintage shutters at thrift shops. They make lovely accents and are fun to use. Have a great Monday!! 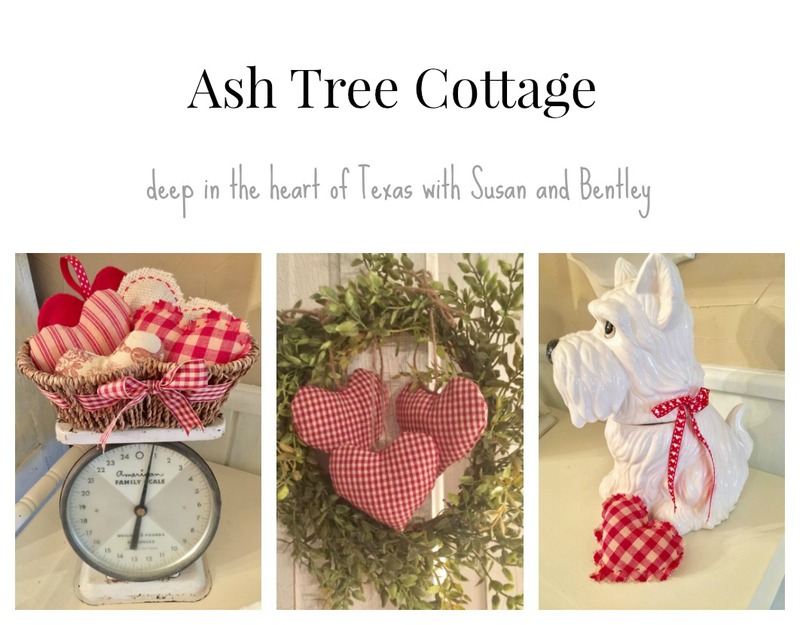 Ash Tree Cottage is 97 years old. It's charming, but it's also quirky as well. The floors creak, there is a mix of old cabinets in the kitchen and somewhat newer maple ones. There must have been an old wood burning stove in the kitchen as the old stove pipe remains. Last night we were at a party at our neighbor's house. They have a historic victorian as well. It has all of it's own quirks. What we decided is that we love our old cottages, despite the creaking floors, small closets, little nooks, crannies and plaster walls. They are comfy like an old pair of beloved slippers. This doesn't look right. I don't remember a pink pillow on my bed or a teddy bear wearing a pink dress or a blankie with pink flowers. I better go find Mom and see if she redecorated my bed. She's always doing things like that. Mom where are you??? She must be out in the garden somewhere. I see some pink petunias ready to be planted and what's this another teddy bear wearing a pink dress??? I'll go look for Mom in the side garden .... Mom??? Where are you??? She's not here either, but there's my pink ice cream cone squeak toy under the pink flower bush. I'll just have to look some more. Mom??? Oh no!!! It's my pink hair brush!!! This isn't a pink dream, it's a PINK NIGHTMARE!!! I better run and hide... I hate being groomed!! Oh no! Oh No!! Wake up Bentley, wake up!! You were dreaming! Are you ready to start taking pictures for your Pink Saturday post for Beverly over at How Sweet the Sound? Laurie wants to see your pics too at her A Few of My Favorite Things Saturday. Let's get ready okay?? Sure Mom! Boy am I glad it was just a dream and I am not living in a pink world. That would be okay for Camilla next door, but I'm a boy dog after all!! This is my vintage wine decanter. My Mom gave it to me several years ago. She used to have lots of luncheons, teas and bridge parties at her house and she used to serve sherry from it. The glass decanter is etched with grapes and leaves. The metal stand is decorated with grape vines as well. When I lived in Virginia, I found these darling little sherry glasses at an antique shop in Historic Leesburg. They are favorites of mine. Please go visit two favorite blogs of mine, Cindy's My Romantic Home for Show and Tell Friday and The Girl Creative for New Friend Friday. Bentley, are you getting set up for your Pink Saturday post? He's napping. Maybe he's dreaming in pink!! Bentley and I are out in the garden this morning when suddenly I find Bentley with an old toy. "Mom is this vintage?" Well, let's see Bentley, it's an old squeek toy that belonged to Bitterman many years ago while the first George Bush was in office. Dan Quayle is on his shoulder. Bitterman chewed off the nose long ago. (This is not a political commentary, just a fact). That was one of Bitterman's favorite toys when he was a puppy, and that was over 20 years ago, so yes, I think it's vintage. Do you want to show it for Suzanne's Vintage Thingie Thursday at The Colorado Lady? Let's show a picture of sweet little Bitterman too. So Bentley, are you working on your big pink post for Saturday?? Bentley?? He's not answering, but I know he's working on it!! Which would you prefer this morning? Coffee or tea? I love a cup of tea in the morning. On the weekends I drink coffee, but during the week, I like a cup of tea. Sometimes I have a cup of tea first, then coffee, because tea just seems more mellow and comforting and a gentle way to start my day. If you are having tea, would you prefer Lipton's or Twinings? I have both. I really love the cute little red tin that stores the English Breakfast Tea! The Twinings is loose tea. Seems more proper somehow, don't you agree? Or how about this cute little red tin that looks like a British telephone booth? It's so cute and it stores tea bags as well. Would you care for a piece of toast with some strawberry jam to go along with your tea? If you change your mind, I can put on a pot of coffee. Meanwhile, sit back and relax and cruise on over to Sue's It's a Very Cherry World for some more bright and cheerful reds! By the way, Bentley wants me to remind you of his "Big Post" for Pink Saturday and Laurie's Favorite Things Saturday. Okay Bentley, I have reminded them. What's that, you are dreaming up something for Vintage Thingie Thursday too?? Ah, the joys of being ruled by a 5 pound Yorkie!! Good Morning! I thought I'd join Cielo at House in the Roses to show off a corner of my herb garden off the back porch for "Show Off Your Cottage Monday". It's a beautiful morning. Very quiet, except for the birds singing and the chickens next door clucking and scratching. Where's Bentley??? He's over in the ground cover next to the fence listening to Beatrice, Florence, Thelma and Louise, our chicken neighbors. While we are enjoying our gardens, the folks down in the gulf region are worried about the oil spill. Please take a moment to stop by Kelee's Katillac Shack for her posting about a prayer session taking place this Wednesday evening for the area devastated by the oil slick. Thank you! It's no secret, little girls love pink. So for today's Pink Saturday, here's a doll's room filled with pink. She's all ready for bed wearing pink jammies and a white robe covered with little pink flowers. She will sleep tonight in bed covered with a chenille duvet, with a bigger pink flower and a little pink pillow for her head. There is a little pink rocking chair to sit in while reading books. Her little pink gingham dress that she will wear tomorrow is on her bed. Oh, and the pink shoes. Can't forget the pink shoes!! While she drifts off in sweet pink dreams, please go visit Beverly's Pink Saturday at How Sweet the Sound and Laurie's Bargain Hunting With Laurie for her A Few of My Favorite Things Saturday. Wait, Bentley has an announcement ... you want to tell everyone that you are planning your own post for the next Pink Saturday and A Few of My Favorite Things Saturday? Do you need any help Bentley or do you plan to do it all by yourself? We'll just have to meet back here next Saturday to see Bentley's big Pink and his Favorite Things post!! Come take a stroll with me on a lovely spring day through the cultural district of Boise, Idaho. Look at this sign, it's one of my favorite shops, Renewal. I want to take a peek inside to see what is new. Would you like to come along with me? When the weather is nice, they often put a few pieces outside. Here are some cute retro kitchen chairs, but I really like that yellow wicker foot stool. If I decide to buy it, I will probably paint it heirloom white. Let's go inside and see what else they have. Look at this darling red wicker chair. Now that it's warm I want to buy lots of wicker pieces!! This is a poster from an Idaho artist. His retro prints are so popular in cabins! If you ever get to Idaho, be sure to drive up to McCall, the skiing is awesome!! Look at this cute retro red phone. You all know how much I love red. If I buy it I will only keep it for show because it is rotary after all. Here is a lovely wool floral area rug. I don't have a place in mind for it at the moment, but I sure do like it. This is a nice hall tree if you are in the market for one. There's that settee again. I think I hear it calling my name!! Now here is a fun chair. Not exactly my style, but I would have fun decorating a room around it!! What a fun shop don't you agree? I love to buy from consignment shops. Lots of opportunity to buy great items and good for the environment too. Reuse, repurpose!! Thanks for going shopping with me today. Let's make a date to do it again very soon. Meanwhile, for some more eye candy, go visit Cindy at My Romantic Home to do some more browsing on this Show and Tell Friday. Bentley, do you think we need a vintage truck like this one?? Tea and a Murder, Oh My!